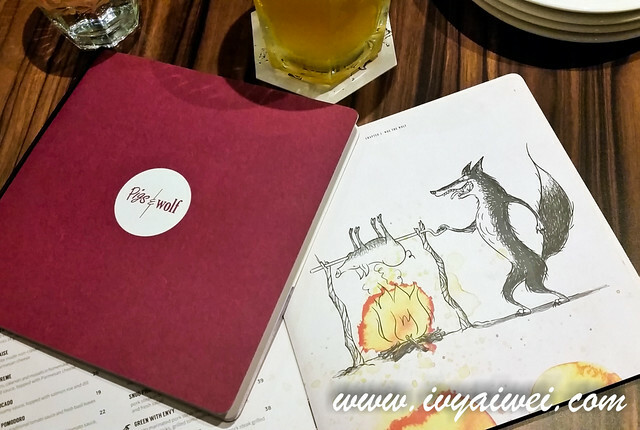 Calling for pork lovers out there. You guys will sure love this! Yes there is another porky place showing up his face in the happening mall! And also my favourite too! 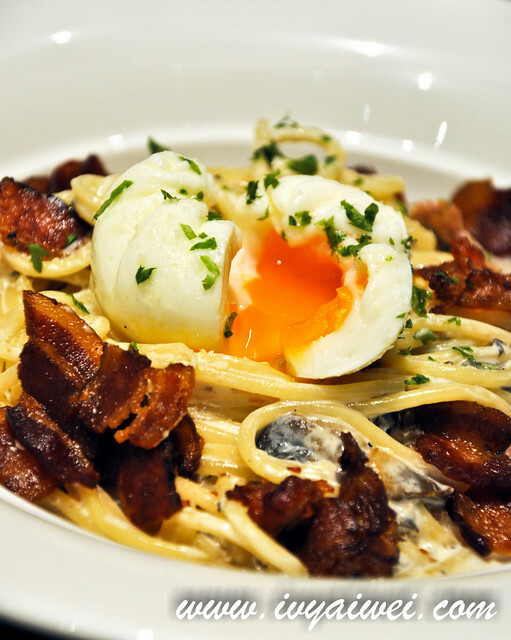 Creamy yet light pasta loaded with crispy bacon bits, mushrooms and topped with a poached egg. Juicy pork patty, cheese, tomatoes, greens, fried egg and herbed mayo sandwiched in between the fluffy sweet buns. The pork patty was pan-grilled to perfection with its juiciness locked in the patty. Flavourful and yummy. one thing, I would be more delighted if the fried egg appeared less cooked. 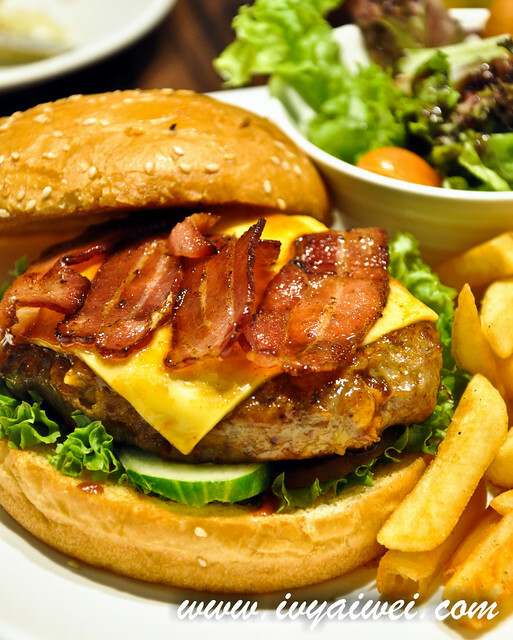 Thick juicy patty and cheese sandwiched in between the fluffy buns, and… this one was with lots of crispy bacon in it! 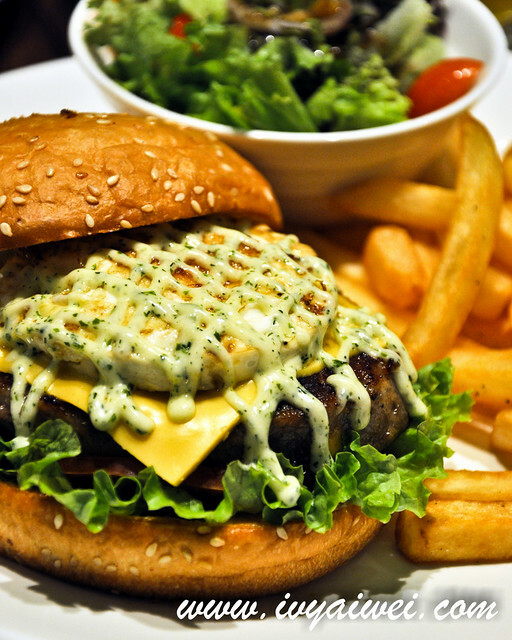 Grilled pork steak served on crunchy lettuce, creamy wasabi mayo, cheddar and ciabatta along with house salad and fries. 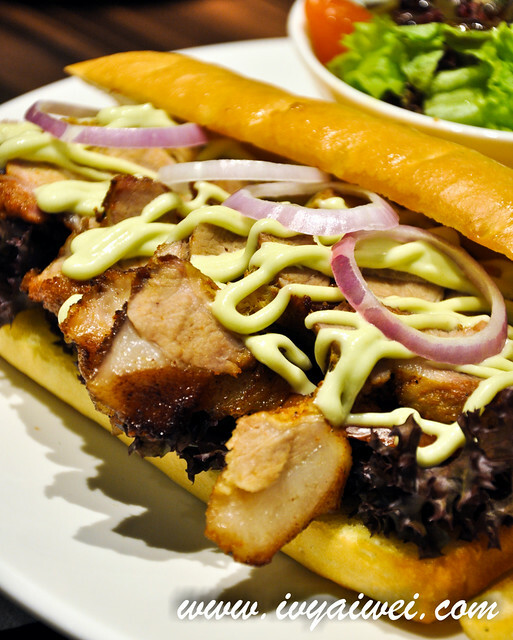 Thick slices of pork steak staked in the bread! 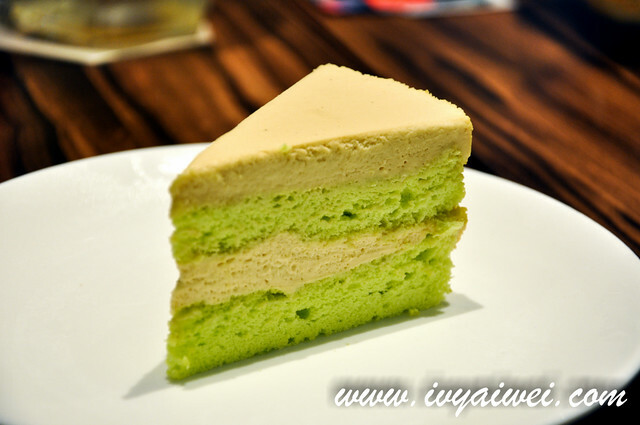 Love the wasabi mayo very much, it brought a special sharp hint to the pork steak. 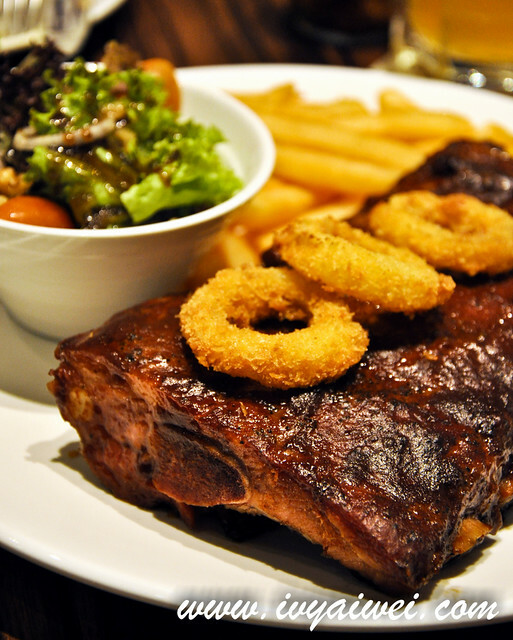 … has become the pork ribs on the table. Ahhh, cute lovely name for the dish. 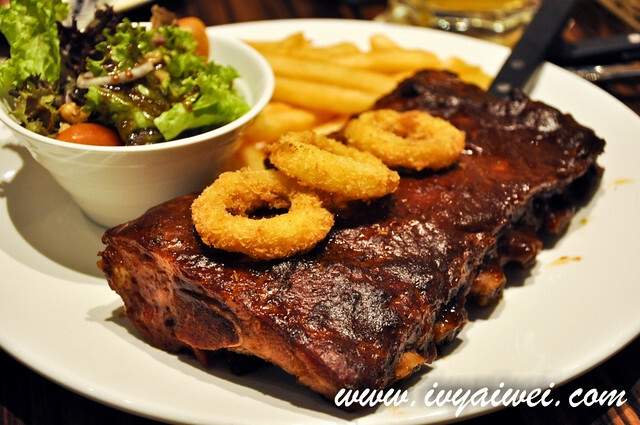 This is actually the pork ribs, one of their signatures. Truly the best pork ribs I have ever had. Seasoned in St Louis style sauce and grilled until tender. It was so fingers lickin’ good! The meat was very tender and easily pulled off from the bone. Filled with explosive mega flavour too. 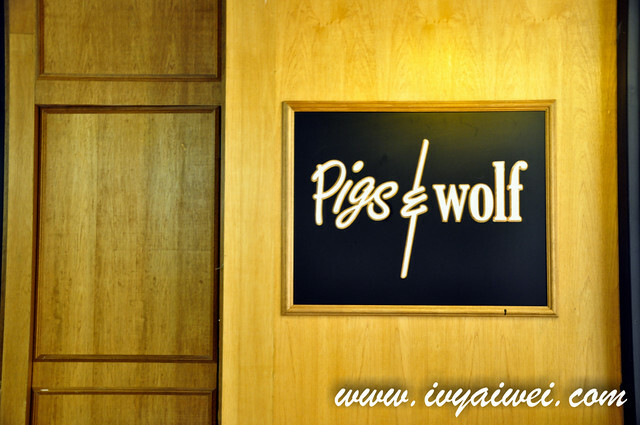 Their secret piggy-wolfey sauce marinated pork steak and grilled to perfection. Loaded with heavy smokey BBQ flavours. 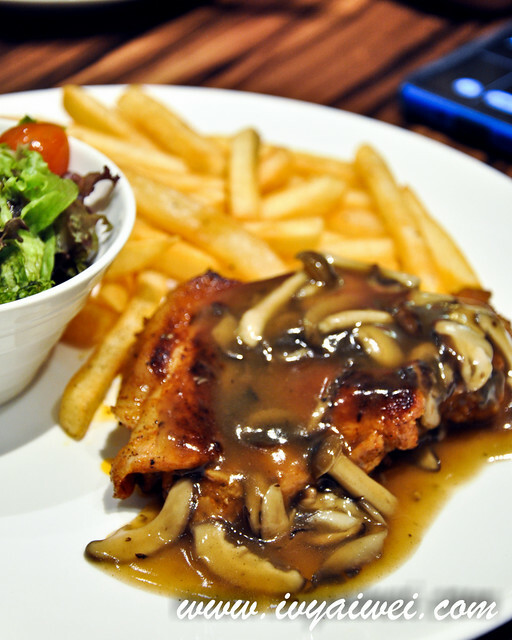 Pork steak in brown mushroom sauce, served with fries and fresh salad. Tasted really old-fashioned but yummy! 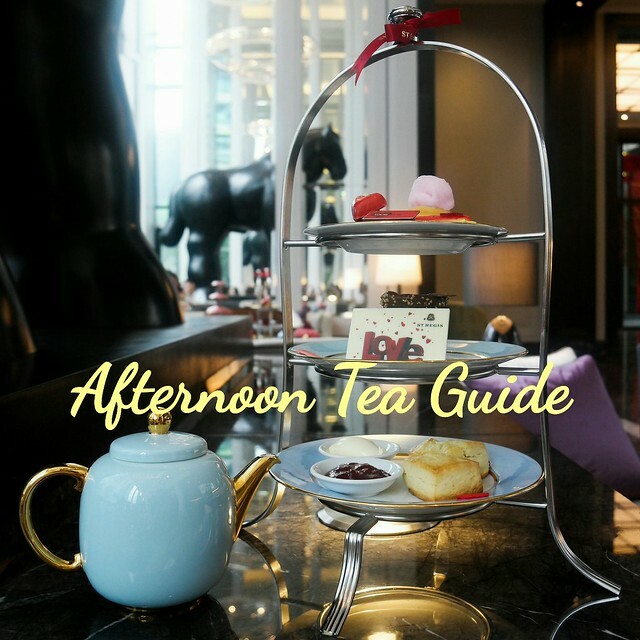 Those who love some nostalgic flavour won’t go wrong with this. 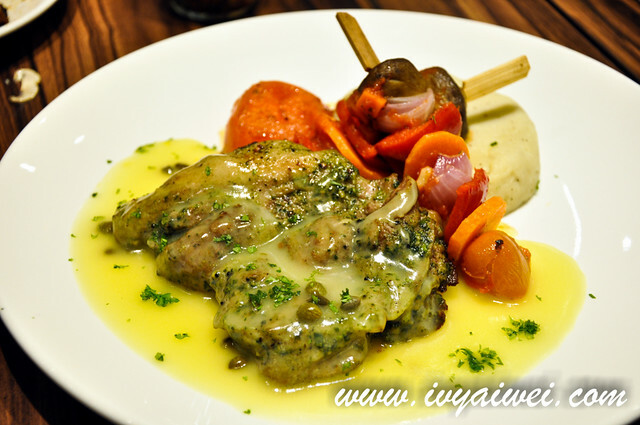 It was the pesto marinated pork steak with lemon sauce, served with vege, grilled tomatoes and mashed potatoes. Something interesting. 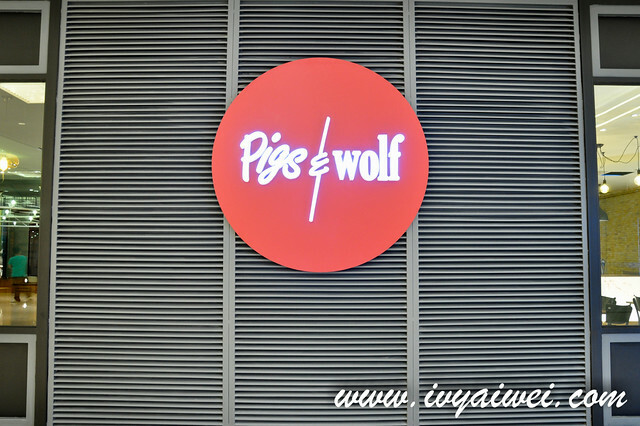 The team behind pig & wolf is really innovative and came out with a lot of idea on how to dress and flavour their pork steak. 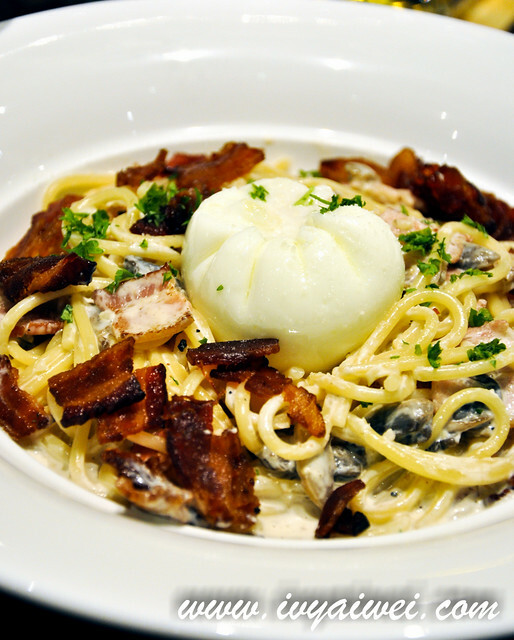 The sauce was tangy sweet and layered with soft savoury hint. 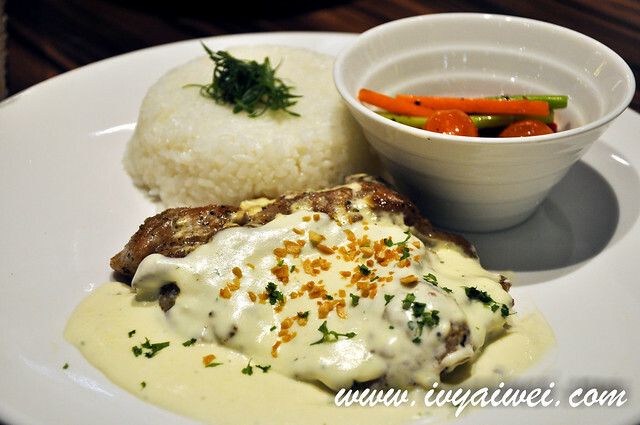 Pork steak in creamy-butter herbed sauce served with steamed vegetables and japonica rice on the side. 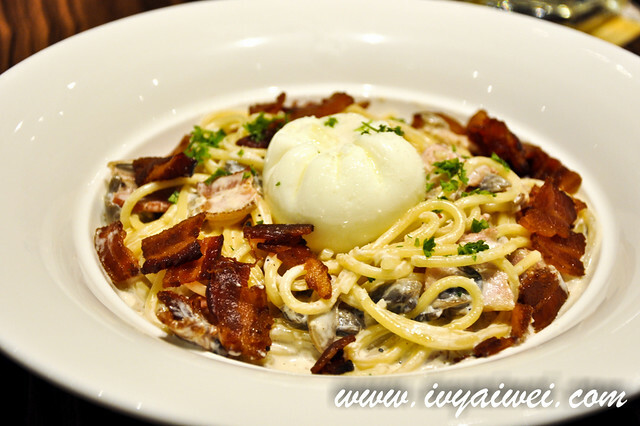 The sauce was creamy with a carbonara-liked, garlicky and pretty fragrant. Hmmm, not my kind of sauce on the pork dish as it was little too creamy to my liking. Good for sharing as it was too cloying to have all by own. Cured in brine until pink, then slow-roasted till crispy and juicy; served with chips, mash and special homemade sauce. Gimme my beer!!! 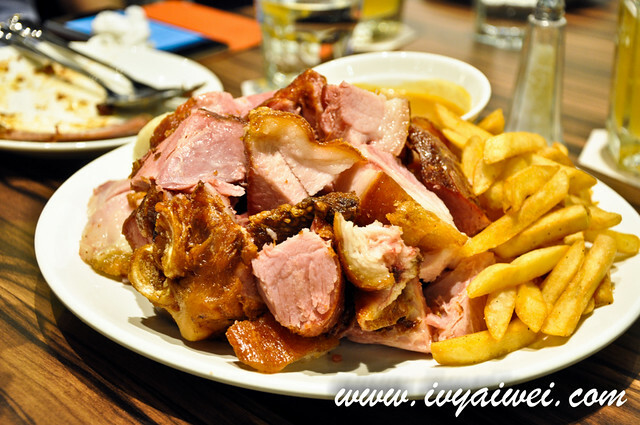 Pork knuckle and beer is always the best couple. 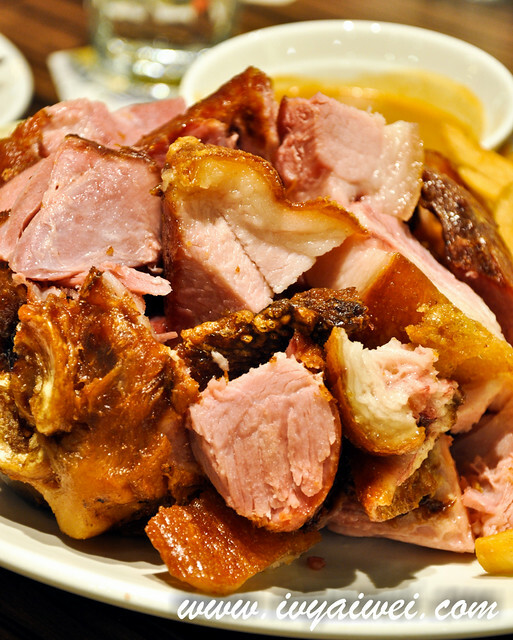 Such a pretty pinkish meat layered with chewy crackling skin and collagen-ous fats. Drenching it with the homemade sauce is optional as it was already very delicious without the sauce. I was actually gulping my saliva when drafting on this whole piece. Just one complaint, if only my stomach allowed me to feed it more at that night… A great dish for sharing and do allow about 30 to 45 mins of cooking time. And Fatboybakes can’t resist the bone too! Some sweet ending for sure! Rum & Raisins Cheesecake was oh-my-god heavenly! 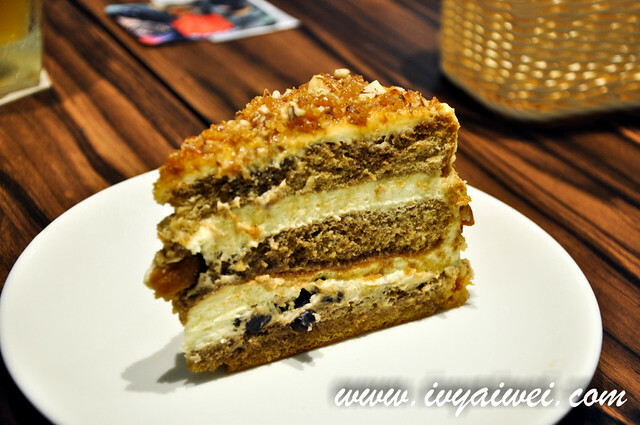 You people must must must try this homebaker’s rum and raisin cheesecake.